Qingshanguan Great Wall was built along the lush mountain ranges in Qianxi County of Tangshan City in Hebei Province. From Beijing, you can take a coach from Sihui Bus Station to arrive in Qianxi in around two hours, and then charter a car to reach Qingshanguan Great Wall by an hour's ride. There is only one bus at Beijing Sihui Bus Station a day, leaving for Qianxi at 08:35. If you are in Tangshan, direct buses to Qianxi are available at Tangshan East Bus Station, West Bus Station, and Fengrun District Bus Station. Upon arrival, you will start this independent Qingshanguang tour with the Ancient Qingshan Castle at the foot of the Great Wall. 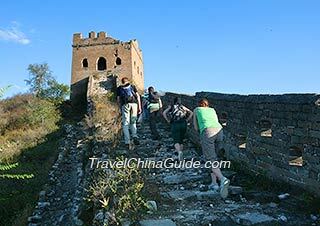 Then follow the signposts to climb up to the wall and visit watchtowers along the ramparts..
After getting down from the Qingshanguan Great Wall, you can either get back to Qianxi Bus Station before 15:40 to take a bus back to Tangshan West Bus Station. Afterwards, walk southwards along South Zhanqian Road for 400 meters (440 yards) to take a high speed train to Beijing. Alternatively, you may spend the night at an old inn in the Qingshan Castle, which was converted from an old courtyard. The next morning, you are suggested to get up early to see the stunning sunrise over the Great Wall and the rolling mountains. After that, please reverse the trip back to Beijing or Tangshan. 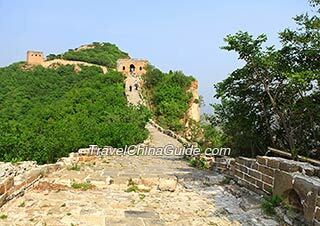 This Great Wall section was built during the reign of Wanli Emperor (1563 - 1620) and has witness numerous fierce battles. Here you can see the only lifting floodgate among the Great Wall sections of China, near the northern gate of the Qingshan Castle. On the southern branch of the ramparts stands a strange tower with no gate or arrow window on the walls but only a vent on the top. This is the Prison Tower which was built for locking up captives and the inner walls are very slippery to prevent prisoners from escaping. Continue walking southwards for some time and you will arrive at a unique tower with 72 arches of different sizes. When looking north, you will see a watchtower named Moon at the highest mountaintop. It was so named because the dangerous terrain there makes it an inaccessible place for ordinary people, just like the moon in the sky. Overlooked from Qingshanguan Great Wall, the ancient town is in the shape of a gold ingot, and hence the nicknamed -'Gold Ingot Town'. It was built together with the Qingshanguan Great Wall with a history of over 400 years. Troops guarding Qingshanguan used to be positioned in the castle. Nowadays, you can still find military facilities remained there, including headquarters, barracks, courier stations, stables, and armouries. There are also well-preserved teahouses, private banks, pawnshops, and ancient courtyards, injecting a bit of flavor of life into the castle.